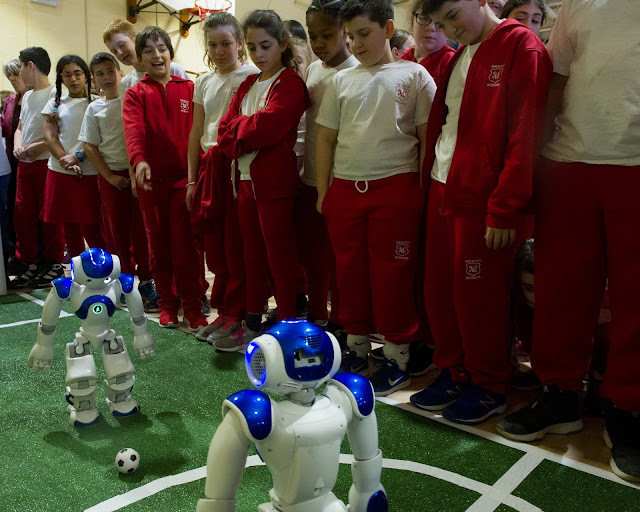 Students like these from Merton are looking forward to being part of RoboCup International. MORGAN JOINS THE TEAM: Long time Montreal broadcaster Barry Morgan has joined the EMSB team for June and will serve as the special media advisor for RoboCup International. PROFILES ON THE EMSB TEAMS: Barry Morgan visited each of the five EMSB schools and profiled their teams. Here is his detailed preview of what they have planned. Director Educational and Technology Services Sandra Furfaro cuts a cake to celebrate the vernissage. ART DISPLAY: A special vernissage was held at the EMSB Administration Building in NDG on June 4, featuring works of art created by students who displayed their talent in various forms. There are about 250 pieces of art ranging from self-portraits to graffiti art, paintings, collage and multi-media works. Students from Michelangelo International Elementary School showcased a number of songs from their choir and performed a few dance numbers with costumes and beautiful choreography. The St Dorothy Elementary School choir also performed several wonderful songs and a group of their students entertained our audience with a bucket drumming show. Royal Vale School also featured live drama performances of Commedia dell’arte and an unforgettable live performance of their string orchestra. The art display will remain in place for visitors to the Administration Building to see until the fall. Videos of the performances will soon be available online. It will continue until the fall. Please see the full press release. See these beautiful photos taken by graphic arts technician Nur Erdem. NEXT BOARD MEETING: The EMSB will hold a special Board meeting on Wednesday evening, June 27 to adopt the 2018-19 budget. BACK TO SCHOOL: Students of the EMSB primary and secondary institutions will return to class on Tuesday, August 28, 2018. Kindergarten children must be five years of age on or before September 30, 2018 while Grade 1 (Cycle 1) students must be six years old on or before the same date. Registration for those not previously enrolled will begin on Tuesday, August 14 for elementary and secondary schools. Parents are asked to call the school in their neighbourhood to make an appointment. Parents are urged to consult the Board’s website at www.emsb.qc.ca, which also contains information about the successful adult education and vocational training programs. E-mail inquiries can be sent to informationdesk@emsb.qc.ca or you can call 514- 483-7200. The EMSB serves more than 44,000 students at 35 elementary schools, 17 secondary schools, eight alternative outreach high schools, seven social affairs institutions and 10 adult and vocational centres. All pupils registering for the first time are required to provide a birth certificate and vaccination records to the school the child will be attending. Parents will be asked to fill out forms which will allow the school to apply for the certificate of eligibility for English schooling. Under the Charter of the French Language, a certificate of eligibility is generally granted to children who did the majority of their elementary or secondary studies in English in Canada; whose mother or father did the majority of his/her elementary studies in English in Canada or whose brother or sister did the majority of his/her elementary or secondary studies in English in Canada. Please note that as a result of Quebec law, this criteria excludes studies completed in the Quebec Private School system. Ronald Robinson, teacher David Armour, former Impact captain Patrice Bernier, Ida Pisano and Isabella Marcelli. EMSB IMPACT NIGHT: For the 13th year in a row, the EMSB is continuing its partnership with the Montreal Impact soccer team through its “All The Way with the Impact” program. Members of the Impact visited two schools this year to remind young students of the importance of studying, persevering and building self-confidence in order to succeed. The traditional “EMSB Night” took place on Wednesday, June 13 when the Impact hosted Orlando City FC at Saputo Stadium. More than 2,250 tickets were sold to EMSB students and staff for the game. Before the game, the EMSB’s presence was recognized and two students were presented with the Tony Licursi Bursary, valued at $500 each. 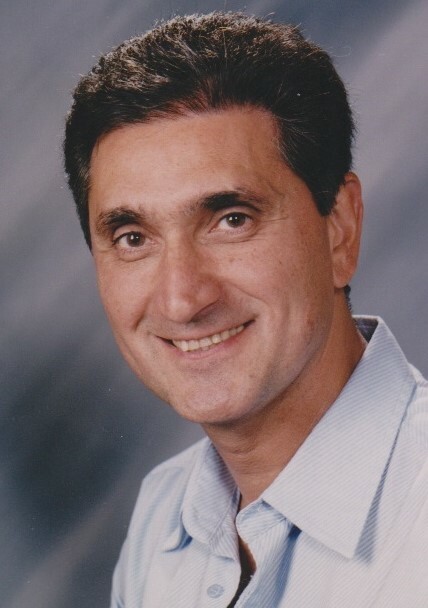 Mr. Licursi was the team’s statistician and a devoted member of the James Lyng High School Alumni Association. He passed away a number of years ago. The award recognizes excellence in school and sports. This year’s winners were Ronald Robinson from John Grant High School in Côte Saint-Luc and Isabella Marcelli from Pierre de Coubertin Elementary School in St. Léonard. Ronald Robinson is a student in the Pre-Work and Semi-Skilled Trade (WOTP) program at John Grant. He is a model student who gives everything his very best. He is known around the school as a polite, caring, positive role model with a warm smile. Isabella Marcelli is in Grade 6 at Pierre de Coubertin. She is recognized as one of the top athletes in the school. More importantly, she is a great team player and shows respect for her peers and teachers with a positive attitude both in the gym as well as in the classroom. Rocco Placentino with his kids Mila Rose and Matteo. BIELLO, PLACENTINO AND THE EMSB: At half time the Impact celebrated their 25th anniversary by honouring some former star players. This included EMSB alumni Mauro Biello and Rocco Placentino. Biello attended St. Monica Elementary School and Marymount Academy International in NDG. Placentino was a student at Gerald McShane Elementary School and Lester B. Pearson High School in Montreal North - part of the first 1999 high school graduating class. Mary Ann Diorio and Frank Spada (top right), some other parents and Gardenview students at the game. GARDENVIEW SOCCER PLAYERS: There was a nice entourage from Gardenview Elementary School in St. Laurent. Parent Frank Spada is the coach of the St. Laurent Under 11 Male Division 1 team in St. Laurent soccer and the team is composed of many Gardenview students. Frank's wife, Mary Ann Di Iorio is the incoming chair of the Gardenview Home and School. MONTREAL ALOUETTES NIGHT: Members of the EMSB family have Friday night, June 22 to look forward to and the home opener of the Montreal Alouettes. Tickets for the 7 pm game vs. Winnipeg are being offered at the very special price of $15. Use Promo Code EMSB 18. Just click on this link. Some of the proceeds from ticket sales will go to Inspirations Newspaper. Some schools have obtained their own promo codes for this game and others during the season. Monfette (Wagar Adult Education Centre in Côte Saint-Luc), have announced they will retire as of July 1, 2018. Their successors will be Robert DiMarco (presently at Westmount Park Elementary School) and Nicholas Katalifos (presently at Roslyn Elementary School in Westmount) respectively. Here are mre principal appointments for the 2018-19 academic year: Marylene Perron, Westmount Park (presently interim VP at John F. Kennedy Adult Centre in St. Michel); Joanna Genovezos, Roslyn Elementary School (presently principal at Coronation School in Côte des Neiges); Mike Talevi, Coronation (presently the principal at Dante Elementary School in St. Léonard); Irini Margetis, Dante (on leave this year as principal of St. Monica Elementary School in NDG); George Koutsoulis, Parkdale Elementary School in St. Laurent (presently interim principal); Silvana Crigna, St. Monica (presently principal of Sinclair Laird Elementary School in Park Extension); Derrek Cauchi, Sinclair Laird (presently principal of James Lyng High School in St. Henri); Lino Buttino, James Lyng (presently the interim principal of the Alternative/Outreach School Network); Rick David, High School of Montreal in the Plateau (presently interim assistant director of AEVS); Darlene Kehyayan, James Lyng Adult Centre (presently interim in that post); and Anna Maria Borsellino, Laurier Macdonald Career Centre (presently Assistant Director of School Organization). 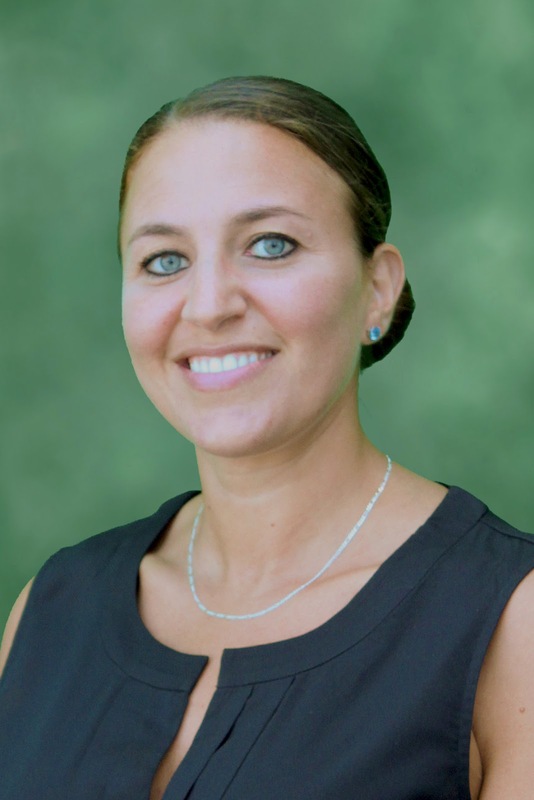 New vice-principal appointments are: Réal Heppelle, FACE (presently vice-principal of East Hill Elementary School in RDP); Jessica Monti, East Hill (presently a teacher at Rosemount High School); Eugenia Carystios, Gardenview (Presently vp at Royal Vale Elementary School in NDG); Maya Doughan, Honoré Mercier Elementary School in St. Leonard (was teacher at Marymount Academy International, currently interim vp at Honoré Mercier Elementary School); Assunta Caruso, Lester B. Pearson High School in Montreal North (presently vp at Leonardo Da Vinci Academy in RDP); Cynthia Canale, Laurier Macdonald High School in St. Leonard (presently a teacher at the school); Tanya Alvares, Marymount Academy International in NDG (presently interim vp at St. Pius X Career Centre); Christy Tannous, Royal West Academy in Montreal West (presently vp at Pierre de Coubertin Elementary School in St. Leonard and pictured above); Vince Timpano, Vincent Massey Collegiate (presently vp at FACE downtown); Matthew Shapiro,Westmount High, presently a teacher at Focus School; Saverio Servello, Royal Vale (presently vp at Rosemount Technology Centre); Ivan Spilak, Leonardo Da Vinci Academy (presently a teacher at Vincent Massey Collegiate); Gregory Watson, Michelangelo International (presently interim vp at Mackay Centre/Philip E. Layton); Ruben Azevdo, Pierre de Coubertin (presently interim vp at Marymount Academy International); Denise Maroun, Mackay Centre/Philip E. Layton (presently interim principal at St. Monica); and Véronique Carriére,John Paul I Junior High School (presently interim vp); and Alain Belair, Rosemount Technology Centre (on sabbatical this year). Some John Paul I students take part in the signing of the entente. 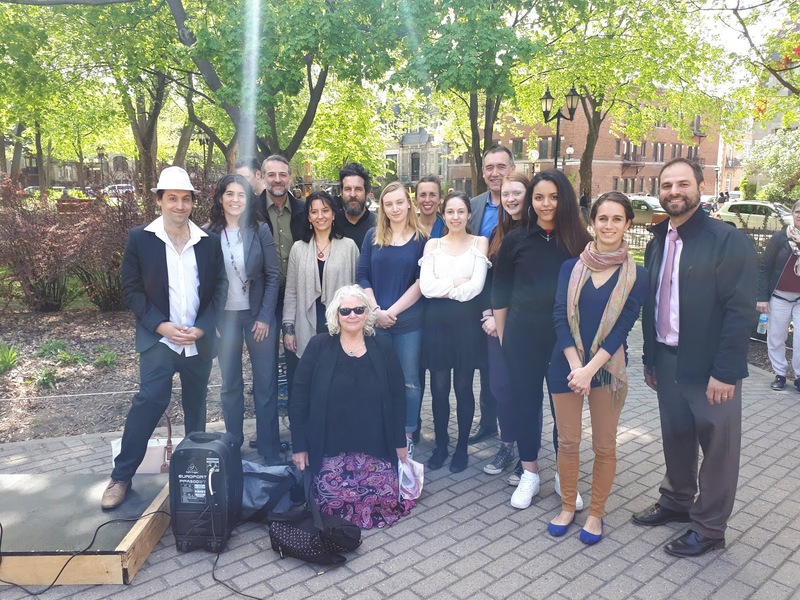 ITALIAN ENTENTE: The Centro Scuola Dante Alighieri di Montreal (CESDA) and the EMSB will continue to act as official partners in the development, conservation and teaching of the Italian language in schools. On Tuesday, June 5 the Consul General of Italy Marco Riccardo Rusconi presided over a "signing" ceremony at the Leonardo Da Vinci Centre in St. Léonard for a new entente. Some students from John Paul I Junior High School were on hand for the announcement. The EMSB offers the PELO Program, (Programme d’Enseignement des Langues d’Origine), teaching Italian in several schools in which a consistent group of students request it, and is interested in continuing to provide this service. The school board recognizes the importance of the heritage language and culture and that the learning of Italian is essential for the students’ social and cognitive training. “We believe that learning a third language helps to improve the learning of the two other languages taught in the school,” said EMSB Chairman Angela Mancini. Ms. Mancini expressed her appreciation to CESDA President Carmine D’Argenio, who played an important role in obtaining the necessary funds from the Italian Government to continue this partnership. For the complete press release and list of schools part of this project please click here. Please see this video, produced by Daniel Smajovits and reported on by Barry Morgan. Principal George Koutsoulis and staff at the launch of digital social stories. DIGITAL SOCIAL STORIES: A new virtual collection of digital social stories for students with autism was launched at Parkdale Elementary School in Saint-Laurent recently. The EMSB has created a virtual collection of digital social stories that are freely available through the Parkdale Elementary School website. Technology teacher Kristen Keyes, along with Principal George Koutsoulis, Maureen Baron, Information and Communications Technology education consultant in the Educational and Technology Services Department at the EMSB, and Parkdale autism class teachers Shelley Sokoloff, Janna Maggio and Nancy Zafiris, presented the digital social stories project to a classroom of parents and trained them how to access and use the stories on their electronic devices. The digital social stories contain helpful strategies for students to use when frustrated by a variety of school-based events such as remaining calm on the school bus, behaving appropriately at recess, what to do when you get angry, and asking for help. Specific situation are broken down and explained through animated visual graphics, and appropriate responses to deal with difficult emotions are offered. Stories were expressly designed to be culturally diverse in order to reflect the Parkdale community. Please see the full press release. STEAM FAIR: General Vanier Elementary School in St. Leonard held their first annual STEAM Fair and Food Festival recently, highlighting the incredible achievements of their students in various STEAM subjects. Additionally, with the help of parent volunteers, foods from eight countries were represented, as numerous STEAM components, such as technology, arts and math, are represented in cooking. LDVA FITNESS: For the second year in a row, students at Leonardo Da Vinci Academy in RDP were treated to Fitness Day. Throughout the day, students engaged in multiple physical activities such as yoga, a fitness boot camp, an obstacle course, soccer, Zumba, karate. Additionally, students tested their fitness and nutritional knowledge via an interactive tablet-based game and played fitness bingo. ATTENTION ALL COMICCON FANS! Will you be attending Montreal Comiccon 2018 this July? We will have an exhibitor table at Comiccon for the third year in a row. Comiccon takes place from Friday, July 6 to Sunday, July 8. Our booth will be number 2323.
victory in Truro, Nova Scotia is among his most cherished memories. Urban Arts is the theme at James Lyng. JAMES LYNG ROCKS: It’s not often you’ll hear a teen saying, “High school rocks!” But it’s hard to think of a better way to describe what’s going on at James Lyng. For the third straight year, the St-Henri borough educational institution is releasing an online “mixtape” of rap and rock songs recorded by students in its music program. See the full story and video in The Montreal Gazette. The Chorale performs at their May concert. CHORALE CONCLUDES SEASON: While the EMSB Chorale officially ended its 38th season with its annual Spring Gala Concert on May 5 at Oscar Peterson Hall, the choir will be making two late June guest appearances. A group of singers from the Chorale will be performing at the Opening Ceremony of the RoboCup 2018 International Symposium on June 17. The choir will also be performing as part of the KI International Choral Festival featuring eight visiting choirs from the United States. The June 24 concert will be held at 7 p.m. at St. James United Church in downtown Montreal and is free and open to the public. The Chorale has had a busy and fulfilling year rich with diverse repertoire, numerous guest appearances and spine-tingling musical moments. 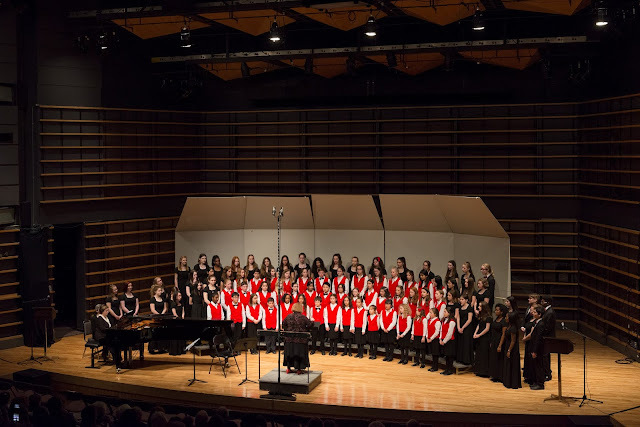 In addition to the choir’s own Holiday and Spring concerts, highlights have included performing at Pollack Hall and the Maison symphonique, singing in Orff’s Carmina Burana with the McGill University choirs and two productions of Bach’s St. Matthew Passion, as well as joining other youth choirs for the annual Earth Hour concert performed by candelight. Plans for the 2018-2019 season include guest appearances with The Lyric Theatre Singers in December, and singing in Carmina Burana once again, this time with Musica Orbium. Students from Grades 4 to Secondary V who are interested in auditioning for the EMSB Chorale can do so as of September 8. For more information, contact conductor Patricia Abbott at 514-483-7200, ext. 7234 or pabbott@emsb.qc.ca. CBC PROFILES ROYAL WEST STUDENT: This profile of Royal West Academy student and longtime Chorale member Kevisha Williams appeared on CBC. Kevisha is graduating from the EMSB Chorale this year after eight years. Director Pat Abbott notes that she has won just about every award they have to give, including Choir Life Award this year for being such a great role model to the younger choristers. She has been accepted into music at Vanier. KEVISHA'S STORY: When Kevisha Williams got a note from the office asking her to go see her guidance counsellor last month, her first thought was: "What did I do now?" But the Grade 11 student at Royal West Academy in Montreal West had nothing to worry about She was being awarded a bursary for her academic success and perseverance in the face of personal challenges. "I just felt really, really happy in that moment," the 16-year-old recalled. On Sunday, she accepted the bursary at a gala held at the Plaza Centre-Ville exhibition hall downtown, organized by Le Fonds 1804 pour la persévérance scolaire, a Montreal non-profit that provides financial aid to students, especially those from ethnic minority groups. The year 1804 is a nod to the end of the Haitian revolution, a slave revolt that led to the abolition of the practice and put an end to French colonial rule over the country. This year, Le Fonds 1804 handed out bursaries to a total of 165 high school students from Montreal, Laval and Longueuil. Each award was worth $250, $500 or $1,375. The students were nominated by a teacher or community organizer in recognition of their determination to succeed in the classroom, explained the group's vice-chairman, Frantz Benjamin. "We believe that in a way, the whole community has to be involved in students' success," Benjamin told CBC News. By recognizing their determination, students are encouraged to stay in school and succeed both in and outside of the classroom, Frantz Benjamin said. (CBC) He said each of the bursary winners has an inspiring story of perseverance, from grappling with health- or family-related challenges, to overcoming bullying.By recognizing their determination, students are encouraged to stay in school and succeed both in and out of the classroom, Benjamin said. "When we stand up together around those children, saying to them that we believe in them, we have faith in them, and we think they can go further." Williams, who has three younger sisters, said her family has faced financial struggles, which adds to the pressure she feels to do well at school. "My mom's a single mom with four kids," she explained. Being awarded the bursary — and seeing other students who, like her, have overcome a lot and succeeded — makes her feel less alone, Williams said. "Often in the moment you'll feel like, 'Oh boy, I'm going through this by myself,'" she said. "But then you come to an event like this, and you're able to recognize that there are other people in the same boat as you, and see that and feel a part of a different community." CAMERON ROCKS: Caroline Cameron has been teaching music in the EMSB for eight years. Born into a musical family from a French Canadian mother and an Anglo-Ontarian father, Caroline started playing music at age three on the violin. 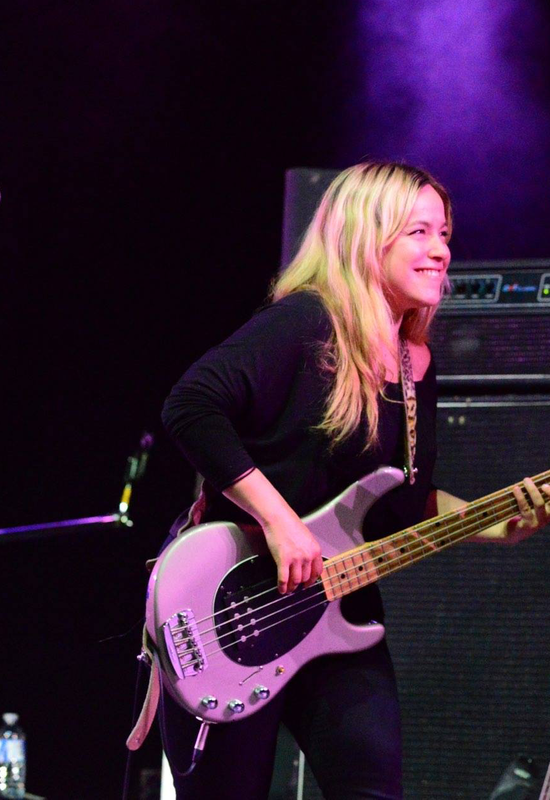 Having completed her college and university studies in performance in bass guitar, she also studied sound recording and completed her masters in music education. Caroline has been a professional touring and studio bass player for the past 15 years with artists like Michel Pagliaro. She is also a professional touring musician. This year, she has been involved in several interesting projects with her students, like “Une chanson à l’école,” where her Grade 6 students had the chance to perform a song with Les Soeurs Boulay. She has also organized many performance opportunities for the students of her school like the winter concert, the spring concert and hosted the Story telling performance concert. You can also check her out on the newly launched EMSB Music You Tube Channel, where she plays the bass with her students performing “Tree Little Birds.” This summer, she will be touring with Elage Diouf all over Canada and the States. She will also play a homage to the band Queen with a choir and symphony orchestra this Saturday, June 16 at Parc Gerry Boulet in St-Jean sur Richelieu (students and parents are welcome to this free outdoor event). On June 23, you can hear her playing bass and singing at Radio Canada (radio) at the Parasol et Gobelet show with Elage Diouf. The show starts at 5 pm. It was all smiles at the gathering. 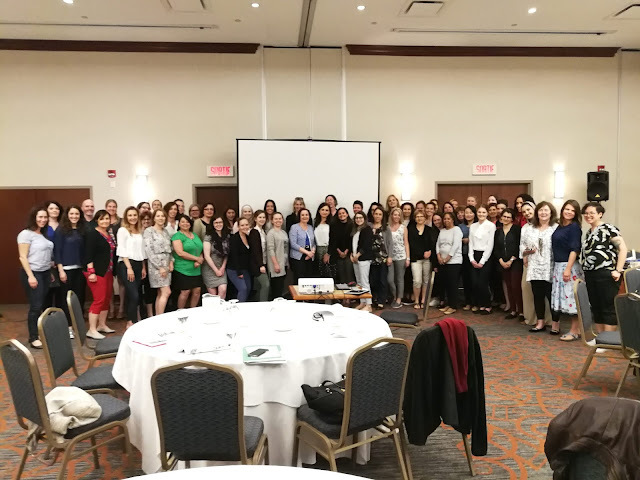 SPEECH-LANGUAGE PATHOLOGISTS GATHERING: The Centre of Excellence for Speech and Language Development recently hosted its annual two-day conference for speech-language pathologists, teachers and other professionals from the ten English language school boards in Quebec. The conference was held.at the Courtyard Marriott Hotel in Montreal and attended by more than 130 participants including 60 speech-language pathologists from across the province. Sarah Ward, a speech-language pathologist and founder of Cognitive Connections in Concord, Massachusetts ,presented “Learn It Today - Use it Tomorrow! Practical Strategies to Improve Executive Function Skills” for our struggling learners. Sarah is recognized as a leading expert in the area of executive function skills and has presented at numerous international conferences including the American Speech Language and Hearing (ASHA) Annual Convention. The Centre of Excellence for Speech and Language Development, operated by the EMSB, is part of the Inclusive Education Service (IES) which is a provincial service funded and mandated by the Ministry of Education (MEES). The Centre of Excellence is made up of a team of professionals including three speech-language pathologists, a psychologist, an occupational therapist, and a special education consultant. The mandate of the Centre of Excellence is to offer support and expertise to the English sector for the organization of programs and adapted teaching for students with special learning needs, specifically in the areas of speech, language and literacy. BATTLE OF THE BOOKS: Please see this excellent video of the recent Battle of the Books produced by Librarian Alissa Rosellini and Information Communications Technology Consultant Kish Gué. LBPHS STUDENTS PROVIDE INSIGHT: The EMSB was proudly represented by the Lester B. Pearson High School Student Council's junior level representatives to provide their insights at the consultation on Montreal's policy concerning children facilitated by Réseau réussite Montréal. Students from all of Montreal’s school boards formed small working groups to look at the five axes of intervention that were identified in the City’s strategy. Students reflected on how the elements of the city policy reflect their personal experiences and those of their peers as well as recommendations for improvements on how their policies for their next action plan. Principal Joseph Vitantonio, Guidance Counsellor Natasha Krsteski and students. THE CLOSET: Students from the Gender-Sexuality Alliance at Lester B. Pearson High School marked International Day Against Homophobia and Transphobia on Friday, June 1 with: The Closet, a pop-up thrift shop in the school’s cafeteria. Students were invited to purchase new or gently used clothes which have been donated by members of the school community at The Closet and all proceeds will be donated to organizations dedicated to help LBGTQ+ homeless youth. The FACE team gathers at St. Louis Square. FOUR SEASONS MOSAIC: Community arts-based arts projects such the Four Seasons Mosaic Art Project at FACE School downtown demonstrates how art projects bring communities together. It is about possibilities, emergent ideas and collaboration. It is having a sense of place and belonging in community. 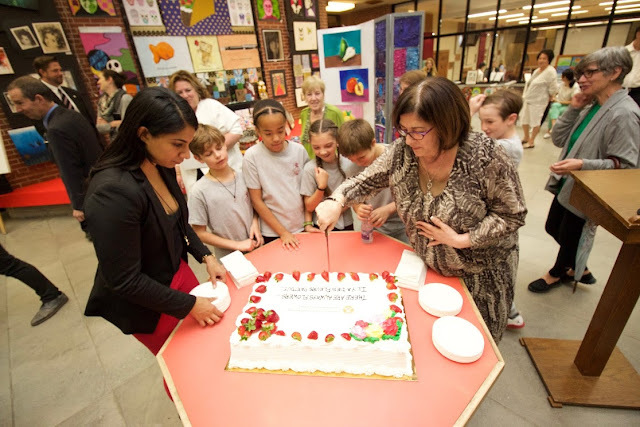 The cross-curricular nature of the project, which included the arts, music, poetry, and other significant activities by the students. This project was devised and organized by EMSB teacher Simone Nichol to create beautiful murals at the base of the historic fountain at the Parc Carré St Louis. In consultation with CSDM and EMSB teachers, Catherine Gregoire, Daniel Tremblay and Rita Saad and Konstantin Velitchkov, artist in residence and master sculptor and ceramist they all agreed to be part of a year-long arts-project which would involve 120 CSDM and the EMSB Grade 11 art students to do a design based on the Four Seasons. This would culminate in a art competition and four students were to be selected as the winners. From October 2017 to January 2018, under the tutelage of the Secondary V art teachers, 120 students from the French and English sectors were involved in doing designs based on the theme of the Four Season. For the Art Exhibition Opening on January 16 four designs were selected: Gaelle Caron (Summer), Karen Senneron (Spring), Bianca Jones (Hiver), and Yasmine Mahrez (Autumn). In the final tally, the project involved over 350 students from Ecole FACE and a dozen CSDM and EMSB teachers. These panels will remain at the park as temporary public art installment for the duration of summer and until November 1. ENCOUNTERS WITH CANADA: Congratulations to Matias Alarcon-Buron, who was awarded the 2018 EMSB Bursary and to Ho-Lisa Nguye, who received the Women’s Canadian Club of Montreal Merit Award for their participation in Encounters with Canada (EWC) this year. They are both Secondary IV students at Vincent Massey Collegiate in Rosemont and returned from EWC inspired and eager to impact their community. Lisa took part in the themed Week called Arts & Culture and Matias participated in the themed week called Science and Ecology . «Encounters with Canada has been an incredible life experience! The friends and memories I made in Ottawa will undoubtedly last! I strongly recommend this to anyone wishing to broaden their horizons to the world! » said Matias. Encounters with Canada is an opportunity for students to participate in our country’s largest and foremost youth forum. Every week of the school year, 120 to 150 teens from across Canada, aged 14 to 17 years, go to Ottawa. The goal of the program is to be introduced to our country's diverse cultures, heritage, beliefs, contemporary issues, institutions and leaders. The program is meant to open students’ eyes to the vast potential of their own lives, as well as that of their communities, their nation, and the world. JOHN GRANT HIGH SCHOOL SCIENCE FAIR : On May 28, John Grant High School students were on hand in the Wagar gym to share their science exhibits. This year’s fair was bigger than ever, boasting 43 exhibitors. Themes included space, natural phenomena, seeds and plants, and other topics of their choice. Students worked diligently since October with their science teacher Tatiana Lednow preparing their multi-dimensional projects. This entailed research, constructing models and project displays, and preparing oral explanations of their research. On fair day, students stood at their booths and presented informative summaries of their work and what they had discovered to each visitor that stopped by. Topics were interesting and varied, from the Milky Way to tsunamis, ice storms, and blood. Presenters were impressive, leaving their visitors with much to think about. Ms. Lednow is proud of the students. “They’ve done a great job. They’ve learnt a lot, they are proud of themselves, and due to their practical and hard work, they will retain the information that they discovered for years to come,” she shared. This teacher prepared an elaborate exhibit of her own – on the topic of How to Make a Science Fair! Rosa Fuoco and Jennifer De Freitas. BASE WINNER: Congratulations to Jennifer De Freitas and the B.A.S.E. Program for winning the Innovation in Teaching or Program Delivery Award from the Quebec English School Boards Association (QESBA) for the Play it Fair! programming in the daycares. QESBA recognized all the activities Jennifer and B.A.S.E. have implemented throughout the last several years on promoting human rights education among daycare children. 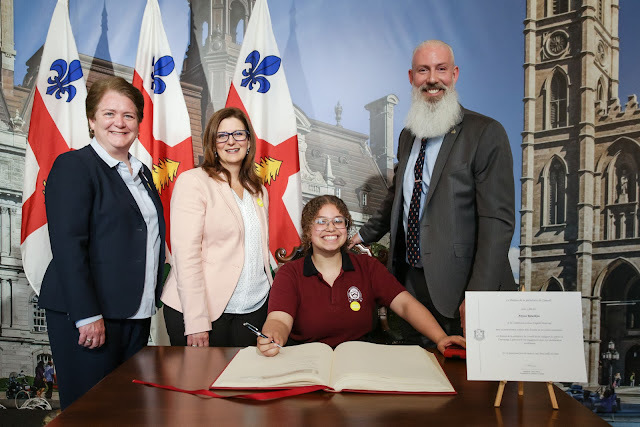 STUDENTS RECOGNIZED: More than 120 students from the EMSB and the four other Montreal island public school boards were honoured at City Hall at special ceremony in May to recognize their efforts in the area of school perseverance. City Councillor Sterling Downey, Angela Mancini and Director General Ann Marie Matheson, welcomed the students to sign the city’s Golden Book and to receive special certificates. This is the third year the city has held such a ceremony. See More Photos. Ann Marie Matheson, Angela Mancini & Sterling Downey. 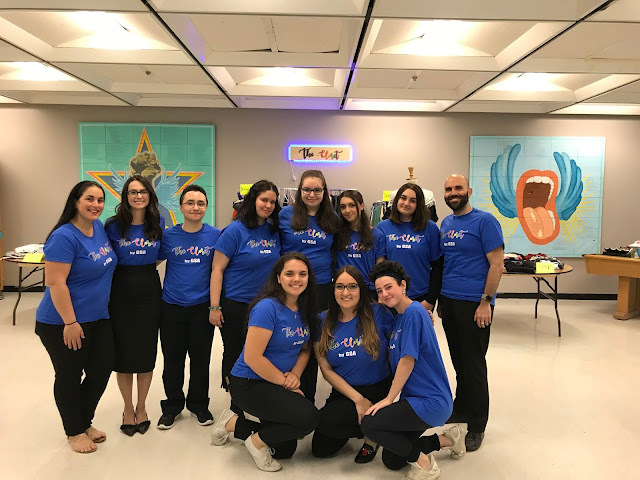 EMSAC LEADERSHIP: The English Montreal School Board Student Advisory Committee (EMSAC), in partnership with Réseau Réussite Montréal, planned and executed an afternoon of leadership activities with Grade 6 students at St. Gabriel Elementary School in Pointe St. Charles on May 28. St. Gabriel students were challenged to work together to solve problems, build trust and talk about their anxieties and expectations as they transition to high school. Staff and students laud a landmark activity. The guiding principal behind this initiative was to engage students in a positive milieu where we could nurture interest in the school environment. The theme of transitioning to high school was chosen because EMSAC students felt it is a difficult rite of passage for many Grade 6 students and anything they could do to ease that evolution would lead to long-term benefits. PRIMER: EMSAC stands for English Montreal Student Advisory Committee. It is made up of two student representatives from each high school in the English Montreal School Board. Regional Directors Pela Nickoletopoulos and John Pevec, Commissioner representative Bernard Praw, Vice-Principals David Servello and Steve Spetsieris join monthly and finally Lester B. Pearson High School teacher Paul Karpontinis serves as moderator. At the beginning of each meeting, the host school conducts a leadership activity that breaks the ice and teaches members new skills. Each host school nominates one of their members to sit in as chairperson and our secretary records the minutes of each meeting. EMSAC is a chance for a select group of students to use their voice and makes the needs and wants of all student bodies in the EMSB known. Through discussions and debates, we try to make every school year better than the last by always taking into account changes in society and schools. This committee gives members a feeling of importance; they know that they are being listened to and their ideas are being taken into account. Every EMSAC member leaves the committee feeling more inspired and knowledgeable than they did at their first meeting. This committee allows high school students to grow. Everyone had a great time at the fire station. FIRE STATION VISIT: Recently, local fire station 39 in Mercier Ouest was filled with the hustle, bustle and excitement of Pre K and ASD 2 students from Edward Murphy Elementary School . 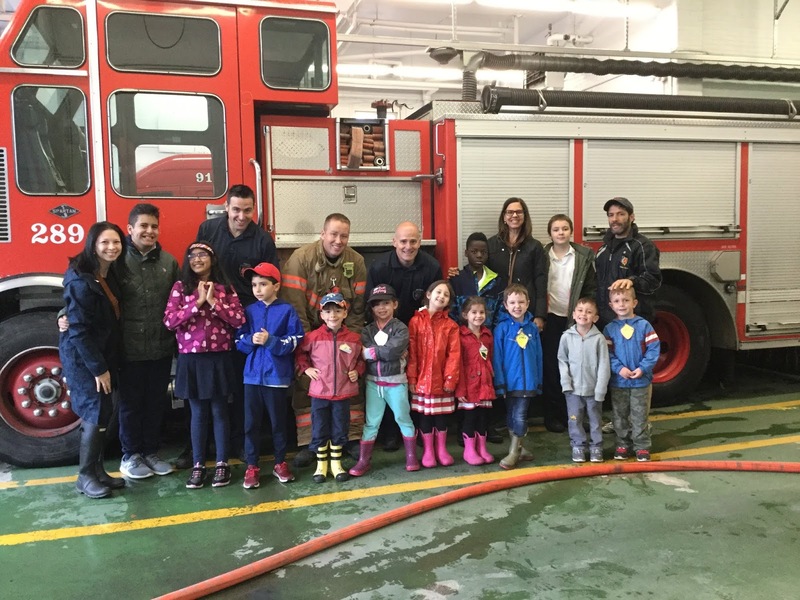 Under the direction of Spiritual and Community Animator Rocco Speranza, the students visited their community fire station as a follow-up to the Fire Prevention workshops given throughout the year. It was also a way to promote community helpers and the “Opening the Doors to the Community Project” led by Speranza earlier in the year. The students had the opportunity to practice using fire hoses, sitting in the fire engines and trying out other equipment. They were also able to see the firefighters beat the clock as they put on their equipment in under 15 seconds. PLANNING EARLY: Royal Vale Elementary School Physical Education and Health teacher Norman Katz is already planning for the next Terry Fox Run on September 27. He has confirmed Kim St. Pierre as a special guest. She is a three-time Olympic Gold Medalist and five- time IIHF World Champion while she was the Starting Goalie for Team Canada in Women's Ice Hockey. 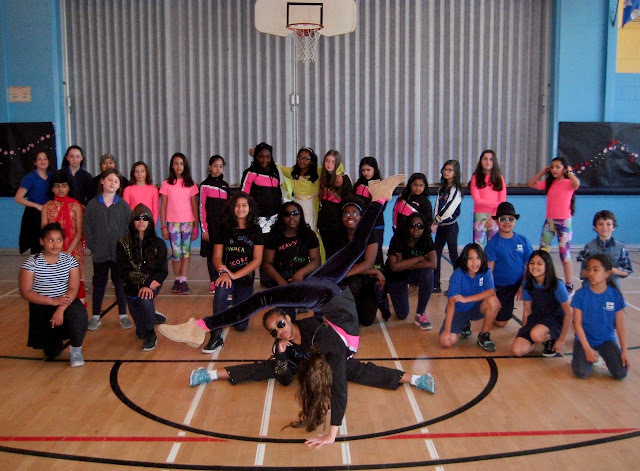 “She is an incredible role model for women in sport and we are lucky to have her as our guest,” said Mr. Katz. It was a real thrill for these Royal Vale students and Mr. Katz to meet Deslauriers and Pacioretty. 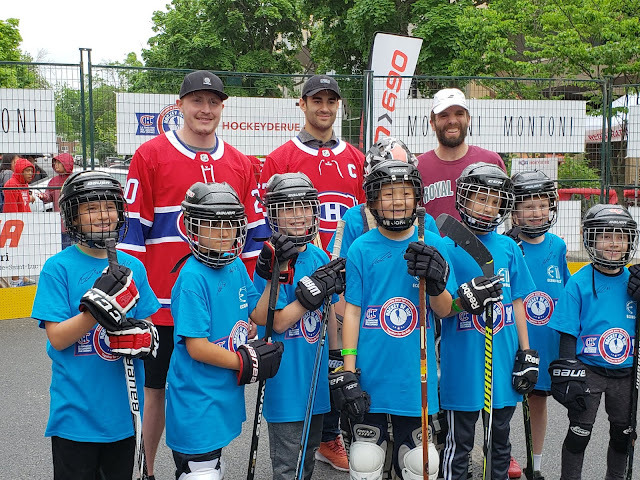 HOCKEY DE RUE: Members of the Montreal Canadiens past and present, including captain Max Pacioretty and Nic Deslauriers, took part in the annual Hockey de Rue fundraising street hockey tournament at the YM-YWHA on Westbury Street. Royal Vale School, guided by Mr. Katz, represented the EMSB. ROYAL VALE GRAD WITH ALS: (Montreal Gazette Story). Christopher Valentine dressed and played for the Alouettes in their final exhibition game last Saturday against Hamilton at Molson Stadium. Christopher is a former Royal Vale student. His father Richard works in Education and Technology Services. Valentine, only 21, joined the Als during the second week of training camp and became the first junior-aged player to dress for a game. He played last season for the Châteauguay Raiders of the Quebec Junior Football League, helping the team capture the championship. Another Raiders player, offensive-lineman Joven Richardson could join him in the game. The 6-foot-3, 200-pound Valentine led the league in receptions, with 28, and was third overall in yards, with 381. As a territorial protected player, Valentine could spend the season practising with the Als and wouldn’t take up a roster spot, although according to a published report last April, he committed to the Concordia Stingers for the 2018 season. The Als always organize combines for junior players, selecting the ones who have the most potential to attend camp. LONG SERVICE RECEPTION: About 120 people attended the annual Long Service Reception, which took place on Tuesday, May 29 at the Le Challenger reception hall in St. Laurent. The EMSB honored 57 employees – ranging from teachers, administrators and support staff -- for their 25 years of service with the Board, which began in 1993. EMSB Director General Ann Marie Matheson, along with several commissioners, school administrators and the directors from the Regional Office, Financial Services, Education & Technology Services, Student Services and Adult Education and Vocational Services, presented the honoured employees with special 25 years EMSB Monarch watches as a token of appreciation. The honourees who were present this year were Danise Clark, Maria Petriello, Rosanna Del Duca and Nancy Trudel (Financial Services); Daphne Labbe (Regional Office); Athina Galanogeorgos (Education & Technology Services); Felicia Zarriello-Bucci (Student Services); Darlene Kehyayan, David Cuffey, Weisan Zhang and Nancy Sanza (James Lyng Adult Centre); Elizabeth Cacchione (Laurier Macdonald Adult Centre); Ryan Anthony Cox (Rosemount Technology Centre); Maria Crasci (Shadd Health & Business Centre); Otto Robert Daniels (St. Pius X Career Centre); Maria Savignano (St. Laurent Adult Centre); Pierre Labrecque (Lester B. Pearson High School); Donna Allsop (Hampstead School); Donna Manos, Panorea Limperopoulos and Leon Tzortzis (LaurenHill Academy); Karen Allen and Kim Watson (Westmount High School); Diane Alain and Lise Langevin (Willingdon School); Bonnie Farmer (Coronation School); Isabelle Fortier (Edinburgh School); Louise Hamelin (St. Dorothy School); Lyne Lacourse and Angelina Vitulano (Leonardo da Vinci Academy); Jill Lieberman and Mary Tsoupanarias (Parkdale School); Denise Maroun (St. Monica School); Pascale Nizri-Lallouz (Merton School); Theordora Stathopoulos (F.A.C.E. School); Cassandra Tertulliani (Venture School); and Civita Tudino (Cedarcrest School). Students were excited to take part in the launch. MISSING CHILDREN: The Missing Children’s Network commemorated International Missing Children’s Day by holding a press conference at Pierre Elliott Trudeau Elementary School in Rosemount where the organization proudly announced the creation of SIGN4L, an application that can save the life of achild. The development of this app was made possible thanks to a generous grant by TELUS.As of today, SIGN4L is available free of charge on most Apple and Android smartphones as well as tablets, and allows users to store up to date photos and vital physical descriptions of their child which they can then instantly email or text to the relevant authorities, allowing them to save time in the event of an emergency. The information that will be saved by parents on their child is not stored in any database. Only parents or guardians will be able to access their children's data sheet. Parents can also rely o n the reminder function, which varies according to the age of the child, allowing them to update their child's profile at any time in the application. SIGN4L also includes safety tips for children as well as the 4 crucial steps to follow in the moments fol lowing the disappearance of a child. "In the event that a child gets lost in a public area, on their way home or, possibly even disappearing altogether , a complete and up to date description of the child can save valuable time and will allow police forces to respond more quickly in initiating searches for the missing child.” says Pina Arcamone, Director General of the Missing Children's Network. "The financial support of the TELUS Montreal Community Board has allowed us to update an important tool that can help us save a child's life.” For more details click here. HOLOCAUST SCHOLARSHIP: The Canadian Society for Yad Vashem (CSYV) Holocaust Scholarship Program is designed to educate Canadian educators, from Jewish and non-Jewish schools, and equip them with the right academic tools to teach about the Holocaust. Each year, CSYV selects up to 20 of the top candidates to attend a 19-day International Seminar on the Holocaust at Yad Vashem in Jerusalem. At the seminar, scholarship recipients learn from world-renowned experts in Holocaust studies about how to best teach the Holocaust. Educators learn how to introduce students to the topic, ensuring a safe learning environment with the provision of age and level appropriate materials to aid the learning process. Upon their return from the seminar, CSYV works closely with scholarship recipients for the next two years to implement Holocaust teaching best practices in their schools and communities across Canada, ensuring that the universal lessons of the Holocaust are conveyed to the next generation of Canadians. 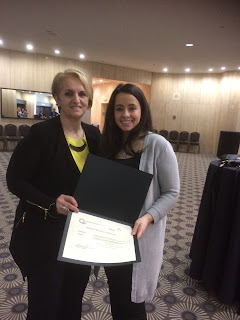 EMSB Violence Prevention Officer Daphna Leibovici is one of this year’s recipients. The Seminar in Israel runs from July 1-20. The scholarship includes airfare, accommodation, tuition and partial meals while attending the seminar in Israel. More information can be found at https://yadvashem.ca/2018-holocaust-scholarship-program. CHILDRENS AUTHOR: Children’s author Lydia Lukidis has been busy giving writing and literacy workshops at EMSB schools this season. Over the years, Lydia has worked with schools such as Coronation, Dunrae Gardens, Edinburgh, Edward Murphy, Elizabeth Ballantyne, Gardenview, Gerald McShane, Honore Mercier, Leonardo Da Vinci, Merton, Pierre de Coubertin, Royal Vale, Sinclair Laird, St Dorothy, St Gabriel, and Westmount Park. The workshops vary from character development to narrative building to creating picture books. Lydia works with the Culture in the Schools program and the workshops are subsidized by the Ministry at a rate of 75 percent and the bonus is that they are always loads of fun! Schools can get more information here: http://www.lydialukidis.com/workshops.html. It was quite the program at Sinclair Laird. TOP LEAF RETIRES: Chief Top Leaf, Albert McCardle, a distinguished educator, has served many different school boards and community organizations since the 1950s. After more than 50 years of service as an educator, he is retiring. In those years, he has served the Protestant School Board of Greater Montreal and then the EMSB with distinction. Since the year 2000, he has worked in close collaboration with the Spiritual and Community Animation Team in educating our students with respect to Indigenous issues. As a result of his work, students had a greater understanding of our Indigenous Peoples and by extension, of those who are different from them. He helped them to develop understanding and acceptance of others. In his work he encouraged us, all of us, to be the best person we can be. INTERNATIONAL STUDENTS NEWS: International students from Rosemount High, John F. Kennedy, Laurier Macdonald, LaurenHill, Marymount, Westmount High, and Royal Vale recentlt enjoyed their day at a sugar shack in Saint-Esprit. Most international students had never tasted Maple syrup before coming to Canada. The students participated in a demonstration of Maple syrup production. They also enjoyed a buggy ride around the forest and tasted a traditional sugar shack meal. The day ended with delicious Maple taffy on the snow. 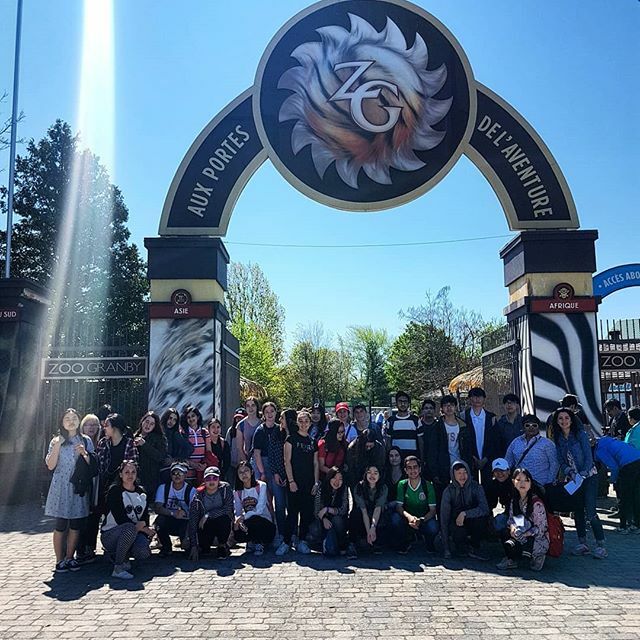 On May 21, international students from Westmount High School experienced Granby Zoo as their last outing of the year. Elisa Medellin, from the International Students Department, organized the trip for 33 students and four monitors. Students had a fun day meeting animals from four different continents. Angela Kim from the International Students Department organized an outing to La Ronde for 18 graduating international students from Marymount Academy. It was a day full of adrenaline and excitement for all the students. BEST 11 ACADEMY: With the school year slowly winding down, Lloyd Barker wanted to take a moment to forward some information about his BEST 11 ACADEMY after school soccer program to you and your students. In this first year of the program, four Riverside School Board schools have signed on. Lloyd did visit a number of EMSB schools. “On a personal level, it makes my heart smile to see such diverse groups of students, male and female, enjoying the beautiful game,” he said. “ I will continue to offer the soccer program annually to elementary schools throughout Quebec. I will be offering a daily lunch-hour soccer program as well as after school soccer programs to three age groups separated by grades. In addition next school year there will be three seasons (fall, winter, spring) of the soccer program. Log on to www.best11academy.com. INDIGENOUS CANADIAN AUTHOR: CBC Montreal is looking for high school teachers interested in putting a novel or graphic novel by an Indigenous Canadian author on their class reading list for the 2018/2019 school year. Interested teachers are asked to fill out a short survey by June 29. Here's the link. Peter Byron and Principal Harry Michalopoulos. HIGH-TECH MISSION TO NEPAL: Peter Byron and Rishi Shrestha are Industrial Drafting teachers at Rosemount Technology Centre and will soon be on a plane heading to Nepal to help people with disabilities. They are volunteering to spend four weeks in Nepal and will bring with them thousands of dollars worth of high-tech equipment to create 3D hands and arms made from plastic which will be provided to people with a disability, free of charge. It's all part of a program called e-NABLE in Nepal. e-NABLE Canada is part of the e-NABLE community, a network of volunteers who use 3D printing to create the limbs for people in need. See the full press release. A GIFT FROM RTC: Galileo Adult Education Centre in Montreal North received a beautifully hand crafted gift built by the teacher James Larocque on behalf of Rosemount Technology Centre’s Cabinet making and woodwork program. A portable puppet show stage was built for the SIS students of Galileo for future puppet show performances. 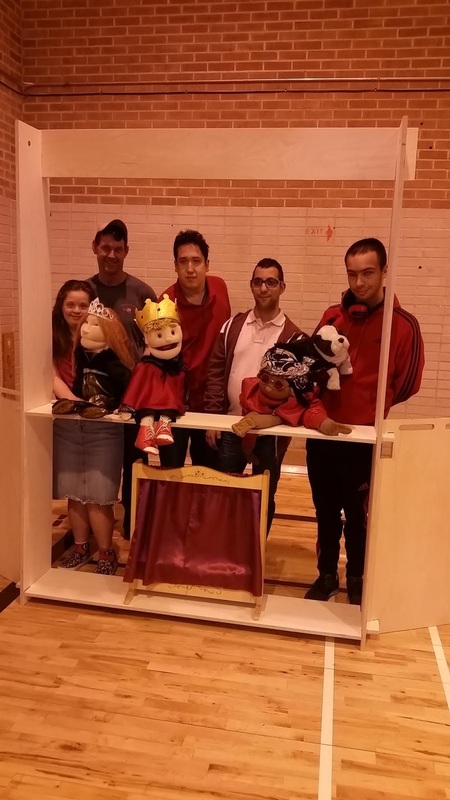 The portable unit is practical in that students are able to assemble and disassemble the stage for performances that they intend to present in other schools. Such puppet themes include; anti- bullying, building friendships and dealing with loss. Today the students gathered to thank and show appreciation to James by presenting him with a handmade thank you card, soaps, cookies and a cactus plant. These were all made on site at Galileo by the SIS students in the culinary, soap making, horticulture and art classes. Galileo also thanks Sam Servello and Joe Anne Desire for making this possible. 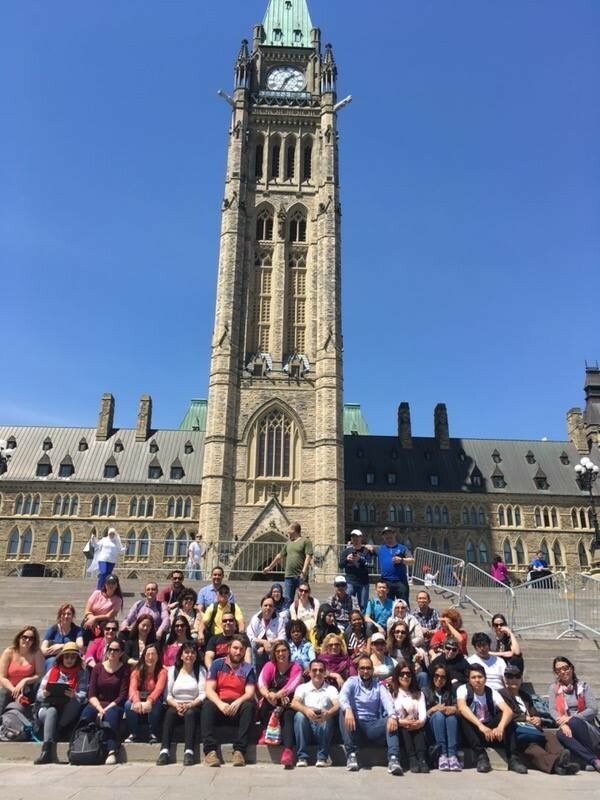 JFK ADULT CENTRE: Fifty John F. Kennedy Adult Education Centre CCBE students, along with teachers Daniela Perillo and Lucy Panetta, enjoyed a day excursion to Ottawa. Following a guided tour of the city, students visited the Nature Museum and walked around Lake Dow. They ended their day by going to the Nation’s Capital to visit the Tulip Festival. This trip allowed students a unique opportunity to use their linguistic skills in a real life situation. This was also a first time visit to Ottawa for most of the students, many of whom are newcomers to our country. 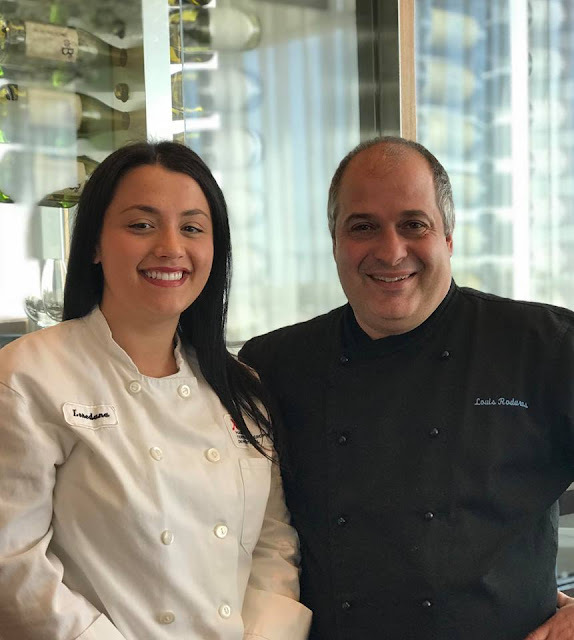 CHEF AT THE BIJOU: Loredana Baita, a graduate of the St. Pius X Culinary Institute, is the pastry chef at Bijou Resto | Bar at The Montreal Airport Marriott In-Terminal Hotel. She has been working there for the restaurant and banquet service for a year and a half. “I graduated from the professional cooking program in 2012, went back to work for two years and I then enrolled in the very first pastry program at Pius,” she says. If you have to pick someone up at the airport anytime soon, this hotel and restaurant are connected to the terminal and parking is validated for up to four hours. You can read more here. ROBOCUP INTERNATIONAL: Plus de 4 000 humains et 5 000 robots provenant de 35 pays se donneront rendez-vous à Montréal dans le cadre de la 22e édition de la Compétition et du Symposium RoboCup International qui se tiendra au Palais des congrès du 18 au 21 juin (Compétition) et le 22 juin (Symposium). Il s’agit de la plus grande compétition de robots intelligents et autonomes au monde. La Fédération RoboCup et les communautés RoboCup des quatre coins de la planète contribuent à stimuler les élèves de tous âges et, qui plus est la recherche, afin d’exceller dans le domaine des sciences, des technologies, de l’ingénierie, des arts et des mathématiques, par l’entremise de la robotique. Ils encouragent le développement des compétences en matière de robotique entièrement autonome, d’apprentissage machine et de langages de programmation. Les participants à RoboCupJunior et RoboCupMajor compétitionneront dans les ligues suivantes : divertissement OnStage; simulation CoSpace; sauvetage; soccer; industries; fabrication; simulation virtuelle; @Home et logistique @Work. La CSEM jouera un rôle primordial dans le cadre de l’édition 2018 de la Compétition RoboCup International puisqu’elle figurera parmi les principaux partenaires de l’événement. Cinq équipes de la CSEM prendront part à la compétition lors de cet événement auquel sont attendus des milliers d’élèves qui visiteront le site et participeront à une formation professionnelle lors du Sommet Innovation qui se déroulera au cours de la semaine. Il s’agit de l’école primaire Pierre Elliott Trudeau et du Collège Vincent Massey à Rosemont, de l’école primaire Dalkeith à Anjou, de l’école primaire Merton à Côte Saint-Luc et de l’école primaire Cedarcrest à Saint-Laurent. Au total, 12 équipes canadiennes prendront part aux ligues RoboCupJunior International et 3 autres à la ligue RoboCupMajor. La conseillère de la CSEM en science, technologie et robotique, Sara Iatauro, agit à titre de présidente d’honneur de la compétition RoboCup International 2018. « Nous sommes emballés de prendre part à ce prestigieux événement », a déclaré la présidente de la CSEM Angela Mancini. « Pendant une semaine, tous les regards du monde entier seront tournés vers cette compétition et je suis ravie que nos élèves puissent vivre cette expérience unique. Au cours des dernières années, notre Commission a effectué des investissements considérables destinés à nos initiatives Robotique et STIAM. Cette année, j’ai réclamé qu’on ajoute un autre conseiller en robotique afin de répondre aux besoins croissants de nos écoles. » Nous vous invitons à consulter l’intégral du communiqué pour savoir comment vous procurer des billets. EXPOSITION D’ART : Un vernissage bien spécial a eu lieu au centre administratif de la CSEM à NDG le 4 juin dernier, mettant en vedette des œuvres d’art diverses créées par des élèves. L’exposition réunit quelque 250 œuvres sous forme d’autoportraits, de graffitis, de toiles, de collages et d’œuvres multimédias. Les élèves de l’école primaire internationale Michelangelo ont interprété quelques chansons du répertoire de leur chorale et ont présenté des numéros de danse agrémentés de costumes et d’une belle chorégraphie. La chorale de l’école primaire St. Dorothy a également interprété plusieurs superbes chansons et un groupe d’élèves a présenté un numéro de tambourinage avec des seaux. La troupe Commedia dell’arte de l’école Royal Vale a offert des représentations théâtrales ainsi qu’une prestation inoubliable de son orchestre à cordes. Les visiteurs du centre administratif pourront admirer l’exposition d’art jusqu’à l’automne. Les vidéos des performances seront disponibles en ligne sous peu. RENTRÉE SCOLAIRE : La rentrée scolaire des élèves des écoles primaires et secondaires de la CSEM aura lieu le mardi 28 août 2018. Les élèves de la maternelle devront être âgés de cinq ans au plus tard le 30 septembre 2018, tandis que ceux de la première année (1er cycle) devront avoir six ans au plus tard à cette même date. La période des nouvelles inscriptions débutera le mardi 14 août pour les écoles primaires et secondaires. Nous invitons les parents à téléphoner à leur école de quartier pour prendre rendez-vous et à visiter le site Web de la Commission, au www.emsb.qc.ca, qui renferme de précieux renseignements, notamment sur les programmes d’éducation des adultes et de formation professionnelle fort populaires. Vous pouvez faire parvenir vos demandes de renseignements par courriel à informationdesk@emsb.qc.ca ou composer le 514 483 7200. La CSEM regroupe plus de 44 000 élèves répartis dans ses 35 écoles primaires, 17 écoles secondaires, 8 écoles secondaires innovatrices, 7 écoles des affaires sociales et 10 centres d’éducation des adultes et de formation professionnelle. Si vous inscrivez votre enfant pour la première fois, vous devrez fournir son certificat de naissance et son carnet de vaccination à l’école qu’il fréquentera. Les parents devront remplir des formulaires afin de permettre à l’école en question de présenter une demande de certificat d’admissibilité à l’enseignement en anglais. En vertu de la Charte de la langue française, un certificat d’admissibilité est généralement accordé aux enfants qui ont reçu la majeure partie de leur enseignement primaire ou secondaire en anglais au Canada, à ceux dont la mère ou le père a reçu la majorité de son enseignement primaire en anglais au Canada ou à ceux dont le frère ou la sœur a reçu la majorité de son enseignement primaire ou secondaire en anglais au Canada. Veuillez prendre note qu’en raison de la législation québécoise, ce critère exclut les études complétées dans une école privée au Québec. SOIRÉE CSEM-IMPACT : Pour une 13e année consécutive, la CSEM a renouvelé son partenariat avec l’équipe de soccer l’Impact de Montréal par l’entremise du programme « Jusqu’au bout avec l’Impact ». Des membres de l’Impact ont visité deux écoles cette année dans le but de rappeler aux élèves l’importance d’étudier, de persévérer et de développer sa confiance en soi afin de réussir. La traditionnelle « Soirée CSEM » a eu lieu le mercredi 13 juin alors que l’Impact recevait FC Orlando City au Stade Saputo. Plus de 2 250 billets ont été vendus à des élèves et des membres du personnel de la CSEM pour ce match. Avant le début de la rencontre, la présence de la CSEM a été soulignée et deux élèves ont reçu une bourse Tony Licursi d’une valeur de 500 $ chacune. M. Licursi était le statisticien de l’équipe et un membre dévoué de l’Association des anciens de l’école secondaire James Lyng. Son décès remonte à plusieurs années. Cette bourse a pour but de souligner l’excellence sur les plans académique et sportif. Les récipiendaires cette année sont Ronald Robinson de l’école secondaire John Grant à Côte Saint-Luc et Isabella Marcelli de l’école primaire Pierre de Coubertin à Saint-Léonard. Ronald Robinson est inscrit au parcours de formation axée sur l’emploi à John Grant. Élève modèle, Ronald donne toujours le meilleur de lui-même dans tout ce qu’il accomplit. À l’école, il est poli, attentionné, souriant et un modèle positif à suivre. Isabella Marcelli est en 6e année à l’école Pierre de Coubertin. Elle est reconnue comme l’une des meilleures athlètes de l’école. Qui plus est, elle est dotée d’un grand esprit d’équipe et fait preuve de respect envers ses pairs et ses enseignants. Elle adopte une attitude positive tant en classe que dans le gymnase. NOMINATIONS ADMINISTRATIVES : Deux directeurs, soit Michael Cristofaro (école secondaire Westmount) et Jacques Monfette (Centre d’éducation des adultes Wagar à Côte Saint-Luc), ont annoncé qu’ils prendront leur retraite le 1er juillet 2018. Ils seront remplacés respectivement par Robert DiMarco (présentement à l’école primaire Westmount Park) et Nicholas Katalifos (présentement à l’école primaire Roslyn à Westmount). Voici d’autres nominations de directions pour l’année scolaire 2018-2019 : Marylene Perron, Westmount Park (présentement directrice adjointe par intérim au Centre d’éducation des adultes John F. Kennedy à Saint-Michel); Joana Genovezos, Roslyn (présentement directrice à l’école Coronation dans Côte-des-Neiges); Mike Talevi, Coronation (présentement directeur à l’école primaire Dante à Saint-Léonard); Irini Margetis, Dante (directrice à l’école primaire St. Monica à NDG, était en congé cette année); George Koutsoulis, école primaire Parkdale à Saint-Laurent (présentement directeur par intérim); Silvana Crigna, St. Monica (présentement directrice à l’école primaire Sinclair Laird dans Parc-Extension); Derrek Cauchi, Sinclair Laird (présentement directeur de l’école secondaire James Lyng à Saint-Henri); Lino Buttino, James Lyng (présentement directeur par intérim du réseau d’écoles innovatrices); Rick David, High School of Montreal sur Le Plateau (présentement directeur adjoint par intérim des SÉAFP); Darlene Kehyayan, Centre d’éducation des adultes James Lyng (occupe présentement ce poste par intérim) et Anna Maria Borsellino, Centre de formation professionnelle Laurier Macdonald (présentement directrice adjointe de l’Organisation scolaire). Les nouvelles nominations à titre de directeurs adjoints et directrices adjointes sont les suivantes : Réal Heppelle, FACE (présentement directeur adjoint à l’école primaire East Hill à RDP); Jessica Monti, East Hill (présentement enseignante à l’école secondaire Rosemont); Eugenia Carystios, Gardenview (présentement directrice adjointe à l’école primaire Royal Vale à NDG); Maya Doughan, école primaire Honoré-Mercier à Saint-Léonard (était enseignante à l’Académie internationale Marymount, présentement directrice adjointe par intérim à l’école primaire Honoré-Mercier); Assunta Caruso, école secondaire Lester B. Pearson à Montréal-Nord (présentement directrice adjointe à l’Académie Leonardo Da Vinci à RDP); Cynthia Canale, école secondaire Laurier Macdonald à Saint-Léonard (présentement enseignante à cette école); Tanya Alvares, Académie internationale Marymount à NDG (présentement directrice adjointe par intérim au Centre de carrières St. Pius X); Christy Tannous, Académie Royal West à Montréal-Ouest (présentement directrice adjointe à l’école primaire Pierre de Coubertin à Saint-Léonard); Vince Timpano, Collège Vincent Massey (présentement directeur adjoint à l’école FACE au centre-ville); Matthew Shapiro, Westmount High (présentement enseignant à l’école Focus); Saverio Servello, Royal Vale (présentement directeur adjoint au Centre de technologie Rosemont); Ivan Spilak, Académie Leonardo Da Vinci (présentement enseignant au Collège Vincent Massey); Gregory Watson, Michelangelo International (présentement directeur adjoint par intérim au Centre Mackay/Philip E. Layton); Ruben Azevdo, Pierre de Coubertin (présentement directeur adjoint par intérim à l’Académie internationale Marymount); Denise Maroun, Centre Mackay/Philip E. Layton (présentement directrice par intérim à St. Monica); Véronique Carrière, école secondaire John Paul I Junior (présentement directrice adjointe par intérim) et Alain Belair, Centre de technologie Rosemont (en congé sabbatique cette année). DES ÉLOGES POUR B.A.S.E. : Félicitations à Jennifer De Freitas et au programme B.A.S.E., lauréats du prix Innovation in Teaching/Program Delivery (innovation pédagogique/prestation des programmes) décerné par l’Association des commissions scolaires anglophones du Québec (ACSAQ) en reconnaissance de la programmation On ne joue pas avec les droits! offerte dans les services de garde. L’ACSAQ a tenu à souligner toutes les activités que Jennifer et le programme B.A.S.E. ont mis en place au cours des dernières années afin de faire la promotion de l’éducation aux droits humains auprès des enfants en service de garde. DES ÉLÈVES HONORÉS: Plus de 120 élèves de la CSEM et des quatre autres commissions scolaires publiques de l’île de Montréal ont été honorés à l’Hôtel de ville lors d’une cérémonie spéciale au mois de mai en vue de souligner leurs efforts de persévérance scolaire. Le conseiller municipal Sterling Downey, en compagnie de la présidente de la CSEM Angela Mancini et de la directrice générale Ann Marie Matheson, ont invité les élèves à signer le Livre d’or de la Ville et leur ont remis des certificats de mérite. C’est la troisième année que la Ville organise une telle cérémonie. Cliquez sur le lien pour voir les photos. AUTEUR JEUNESSE: Lydia Lukidis, auteur de littérature pour enfants, a été fort occupée cette saison à animer des ateliers d’écriture et de littératie dans des écoles de la CSEM. Au fil des ans, Lydia a travaillé avec plusieurs écoles, notamment Coronation, Dunrae Gardens, Edinburgh, Edward Murphy, Elizabeth Ballantyne, Gardenview, Gerald McShane, Honoré Mercier, Leonardo Da Vinci, Merton, Pierre de Coubertin, Royal Vale, Sinclair Laird, St. Dorothy, St. Gabriel et Westmount Park. Les ateliers portent sur le développement des personnages, la création de la narration et la conception de livre d’images. Lydia applique le programme La culture à l’école et les ateliers sont subventionnés à 75 % par le ministère. Qui plus est, les ateliers sont toujours très amusants! Les écoles qui désirent en savoir davantage sont invitées à visiter le http://www.lydialukidis.com/workshops.html. DÉPART À LA RETRAITE DE TOP LEAF: Le chef Top Leaf – Albert McCardle –, éminent éducateur, a été actif au sein de plusieurs commissions scolaires et organismes communautaires depuis les années 1950. Au terme d’une carrière d’éducateur qui se sera échelonnée sur plus de 50 ans, il a décidé que le moment était venu de tirer sa révérence. Au cours de sa carrière, il a été à l’emploi de la Commission des écoles protestantes du Grand Montréal, puis de la CSEM. Depuis l’an 2000, il travaille en étroite collaboration avec l’équipe d’animateurs de vie spirituelle et d’engagement communautaire dans le but d’éduquer nos élèves sur les questions autochtones. Grâce à son travail, les élèves ont une meilleure compréhension des peuples autochtones et, par le fait même, des différences entre les peuples. Il les a aidés à développer une compréhension et l’acceptation d’autrui. Dans le cadre de son travail, il a encouragé chacun d’entre nous à donner le meilleur de nous-mêmes. UN CADEAU DU COLLÈGE DE TECHNOLOGIE ROSEMONT: Le Centre d’éducation des adultes Galileo à Montréal-Nord a reçu un superbe cadeau fabriqué à la main par l’enseignant James Larocque au nom de l’équipe du programme d’ébénisterie du Centre de technologie Rosemont. En effet, un théâtre de marionnettes portatif a été fabriqué pour les élèves des Services d’intégration sociale (SIS) de Galileo en prévision de leurs prochains spectacles de marionnettes. Ce théâtre portatif est fort pratique puisqu’il permet aux élèves de l’assembler et de le désassembler lors de représentations offertes dans d’autres écoles. Parmi les thèmes abordés, mentionnons la lutte contre l’intimidation, la création de liens d’amitié et la perte d’un être cher. Les élèves se sont réunis afin de témoigner leur reconnaissance à James en lui remettant une carte de remerciement, des savons et des biscuits, tous faits à la main, ainsi qu’un cactus. Tous ces objets ont été fabriqués sur place à Galileo par les élèves des SIS, dans les classes de cuisine, de confection de savons, d’horticulture et d’art. Galileo a également remercié M. Sam Servello et Mme Joe Anne Desire qui ont fait en sorte que ce soit possible. Un grand merci à tous! 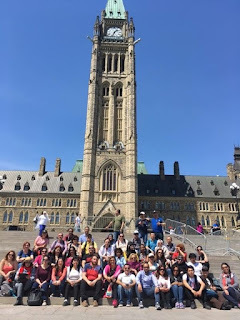 CENTRE D’ÉDUCATION DES ADULTES JFK : Cinquante élèves du programme de formation de base commune (CCBE) au Centre d’éducation des adultes John F. Kennedy, en compagnie des enseignantes Daniela Perillo et Lucy Panetta, ont profité d’une belle excursion d’un jour à Ottawa. Après une visite guidée de la ville, les élèves ont visité le Musée canadien de la nature et ont fait le tour du lac Dow à la marche. La journée s’est terminée par une visite au Festival des tulipes dans la capitale nationale. Ce voyage a permis aux élèves de mettre en pratique leurs compétences linguistiques dans des situations réelles. Il s’agissait également d’une première visite à Ottawa pour la plupart des élèves, dont plusieurs sont de nouveaux arrivants au Canada. CHEF AU BIJOU : Loredana Baita, diplômée de l’Institut culinaire St. Pius X, est chef pâtissière au Bijou Resto | Bar, le restaurant de l’Hôtel Marriott situé dans l’aérogare de l’Aéroport de Montréal. Elle travaille au restaurant et au service de banquets depuis maintenant dix-huit mois. « J’ai obtenu mon diplôme en cuisine professionnelle en 2012, je suis retournée sur le marché du travail pendant deux ans, puis je me suis inscrite au tout premier programme de pâtisserie offert à Pius », a-t-elle indiqué. Si vous passez prendre quelqu’un à l’aéroport prochainement, cet hôtel et restaurant sont reliés à l’aérogare et le stationnement est validé pour une période de 4 heures. Pour en savoir davantage, visitez le http://mtlrestorap.com/mike-cohen-lands-at-the-montreal-airport-marriott-in-terminal-hotel-bijou-resto-bar. The next Focus will be published on August 29. Submissions should be made to Michael J. Cohen preferably by e-mail (mcohen@emsb.qc.ca) by August 24 at Noon.